This weather and fire resistant outdoor ashtray is made of 20 gauge stainless steel. The 215 cu. inch inner receptacle holds over 700 butts for minimal maintenance and is easy to remove and empty. 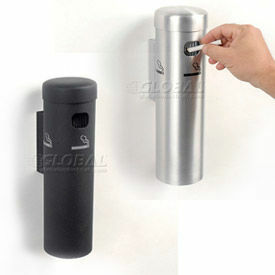 Measures 9"W x 5"D x 13"H.
Durable Steel Cigarette Receptacle Mounts To Wall For Convenient, Out-Of-The-Way Placement. Wall mountable outdoor ashtrays offer a stylish alternative to cigarette receptacles. Durable aluminum and steel construction is fire-safe and wont rust or tarnish. Year-round powder coat finish prevents cigarette burn damage. Cigarette snuffer included to encourage proper disposal of cigarettes. Mounts to wall or column with included mounting bracket. 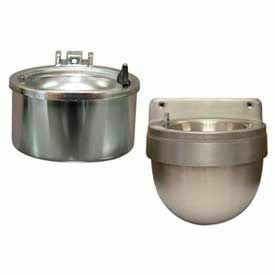 Measures 4 diameter x 16 H. Swivel Mount Ashtrays stay secured to wall while emptying for easy maintenance. Swivel mount features a hex screw to keep cap on unit. Simply unlock hex screw with 2 included hex keys, remove top and rotate unit to the side while still on the wall for easy emptying. Locks in place in upright position. 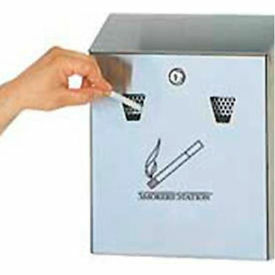 Smoker Stations Provide Safe Extinguishing And Containment Of Cigarette Waste. Smoker Stations are available in several styles. Frost Stainless Steel Ash Bins are stainless steel with a corrosion-resistant galvanized steel inner liner. Offset mounting bracket keeps unit 5/8" away from the wall to ensure fire prevention. Full-length piano hinge and tumbler keyed lock. Available in 2 sizes. Impact® Wall Mounted Ashtrays are UV treated and will not rust or corrode. Compact design with contemporary look. Wall-mountable. Available in 2 sizes. Rubbermaid® Wall Mount Urn With Lock features two stainless steel extinguishing screens and a galvanized steel liner for easy emptying. Keyed cam lock ensures security. Mounting hardware included. Available in Stainless Steel or Black Textured Steel. Smoker Stations may be mounted on walls or on poles/pedestals (sold separately). These compact ashtrays mount to the wall and can be placed next to building entrances. Helps keep cigarette butts out-of-sight. These durable, corrosion resistant outdoor ashtrays are easy-to-clean and easy-to-empty in seconds. Bins sloping top prevents litter being placed on top. Grill front accepts only cigarette disposal. Unique internal baffles reduce smoke return and reduce oxygen inside collection box. Mounting plates and inner collection boxes are made with 304 grade stainless steel with a brushed satin finish. Front features a stub-out zone with stainless steel mesh. Concealed key lock discourages tampering and permits emptying in seconds. Mounting hardware included. Satin Brushed Stainless Steel Ashtrays are backed by a Lifetime Limited Warranty. 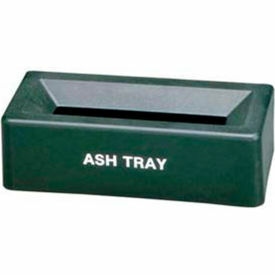 Powder Coated Ashtrays are made with durable steel and feature a polyester/epoxy powder coated finish in choice of Antique Green or Black body. 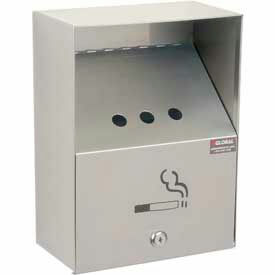 Impact® Wall Mount Smoking Urn Is Used For Inside Or Outside Designated Smoking Areas. Impact® Wall Mount Smoking Urn is made of plastic for long lasting durability. Top flips open for easy discarding of ashes and cigarette butts. The words, Ash Tray, printed on outside. Insert tray removes for easy cleaning and removal. Desk and Econo Ash Tray designs are also available. 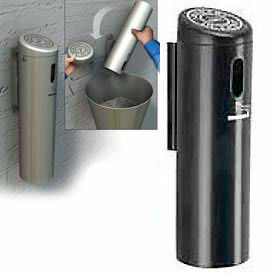 Compact Metal Well Cigarette Urns Are Used For Indoor Or Outdoor Cigarette Disposal. Compact Metal Well Cigarette Urns are made of aluminum or metal for long lasting durability. Aluminum urn includes flip top to allow easy disposal of smoking material, discarded cigarettes or trash. Removable top accesses inner liner for easy emptying. Epoxy finish resists cigarette burns. Steel urn with removable push button split for easy disposal of smoking material, provides top attached by security chain and includes mounting hardware. Metal wall ash try designed with theft-proof hinged lid. Color finishes are Chrome and Satin. Dimensions and styles vary per style. 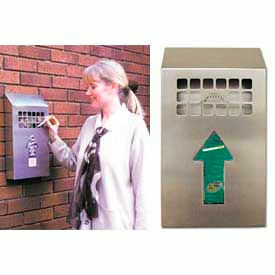 Wall Mount Cigarette Receptacles Are Designed To Blend With Modern Décor While Assisting Daily Maintenance Requirements.